Attacks are organized in waves. Every next wave is more powerful than the last one, and the more waves you hold on defending your ‘tower’, the more coins you’ll earn for buying superpowers and upgrade for your kitchen appliance. When the level is finished, you will see the menu showing which upgrade parts are available, and you can buy the one you need to improve your defence effect. 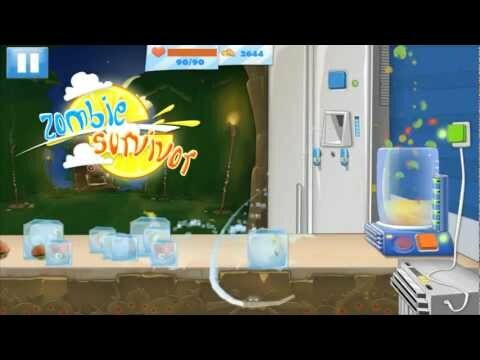 From your screen you can choose to freeze your enemies, to kick them away from the zone of your precious mixer, to speed up the recovery of juicer’s health and many other superpowers. As you progress in this awesome defense game you’ll get better in resisting fruit frenzy attacks and you’ll complete all kinds of interesting achievements. But the attackers will also become stronger and will be able to break the glass easier! If you manage to resist 100 waves, you’ll become fruit ninja juicer and master this defender game! There are three cities to defend in this arcade game: Cabo, Honolulu and Miami. When you finish all the levels from these three cities you will unlock Survivor endless mode, in which you have manage to resist froot attacks and turn your foe into “fruit slice” for 100 levels. Finally you'll have to deal with Melon King and when you manage to throw him into blender you'll bring the ruthless zombie invasion to an end! Download Blender Defender Fruit Slicer and have fun playing this great tower defence game, which is a great “game for kids” too! You can play our games and enjoy using our apps, it’s totally free! If you're a fan of bloon tower defence and defender 2 games, you will definitely enjoy this free “defense game”!